Another common anti-vaccine attempt at rationalizing the fear they want to instill in you is to point at the “Vaccine Adverse Events Reporting System”, or VAERS. It is a system set up as a repository for reports from the public of “adverse” events following immunization. The vaccine injury act created it. Just about anyone can post an event to the system, and it is up to epidemiologists at the Centers for Disease Control and Prevention (CDC) to look into the reports and investigate them. In most cases, it is determined that the event had a cause other than the vaccine. But that doesn’t stop the anti-vaccine groups from scaring you through quoting numbers they got from VAERS. It is as if you were to look at the nightly news and determine that you’re not going to interact with the world because, hey, bad things happen out in the big, bad world. Though only the bad news gets reported, many times, what you get in a 2-minute blurb is not a true picture of reality. Want proof? Let’s do this step-by-step, so you can follow along and discover the “evidence” along with me. Before we do that, let me warn you about a site that purports itself to allow you to analyze VAERS data. The site is called “medalerts.org”. If you look at the site’s disclaimers, you’ll learn that it’s run by an anti-vaccine group. Furthermore, some of the conclusions drawn from the data in there seem to be based only on the raw numbers. I can’t find any critical thinking there. So let’s do our own thinking. Let’s look at reported deaths associated with vaccines. First, go to the VAERS website here. 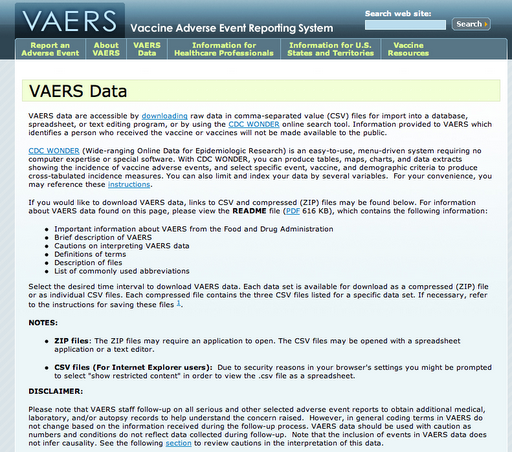 After you’ve read through all the caveats of the VAERS database, click on the bottom link to proceed. That’s it. Now click on “SEND” at the bottom of the page. You will not be presented with all the reported deaths submitted to VAERS, for all ages, genders, and locations. It’s a huge file, so give it some time. 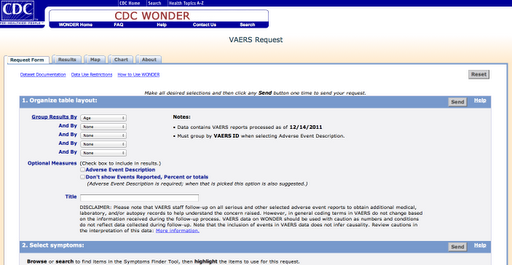 As of 12/14/11, a total of 3,504 deaths have been reported to VAERS. Anti-vaccine groups will tell you that all those deaths are from vaccines and that they’re evidence of how deadly vaccines are. Are they? Let’s separate the wheat from the chaff. There are plenty more related to suffocation, but you can see those for yourself now that you know how to access the data. So let’s just look at one more. As with car accidents, these accidental drownings were also submitted. Unfortunately, I’m sure many anti-vaccine advocates will not hesitate to make giant leaps based on these reports. I’m not kidding you. Someone actually suggested that the person who drove out in front of a car was “disabled by the vaccine and couldn’t drive” the car or that the accident was done “to cover up the vaccine damage”. This entry was posted in Blog and tagged #antivaccines, #conspiracies, #criticalthinking, #evidence, #vaers, #Vaxfax. Bookmark the permalink. Thank you. Your stuff is not bad, either. You're no "EpiRen" (http://epidemiological.net), but you're up there. Excellent, excellent post Poxes! I have no doubt that I will use this on my blog for a reference.